2. it’s at a restaurant/with a chef you are a fan of. So, done and done. James Beard Award-winning Portland chef and restaurateur Vitaly Paley is partnering with LibertÃ© yogurt to introduce the yogurt to the market and create a variety of unique food pairings, combining the yogurt with his taste for local fare. 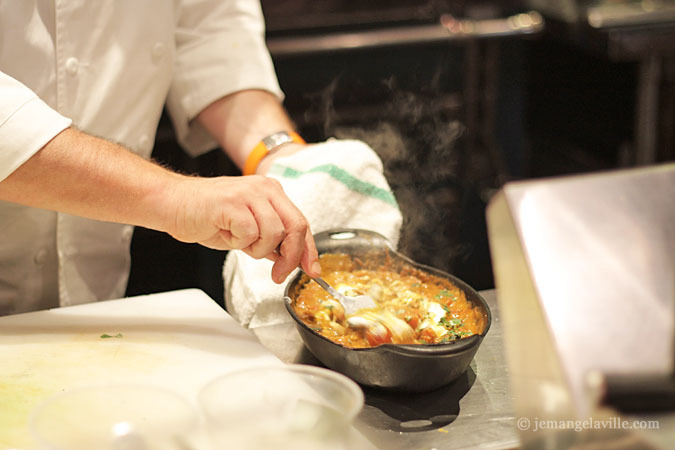 Chef Paleyâ€™s appreciation for regional Pacific Northwest flavors and ever-evolving interest in distinctive food pairs well with LibertÃ©â€™s dedication to clean flavor and pure taste. 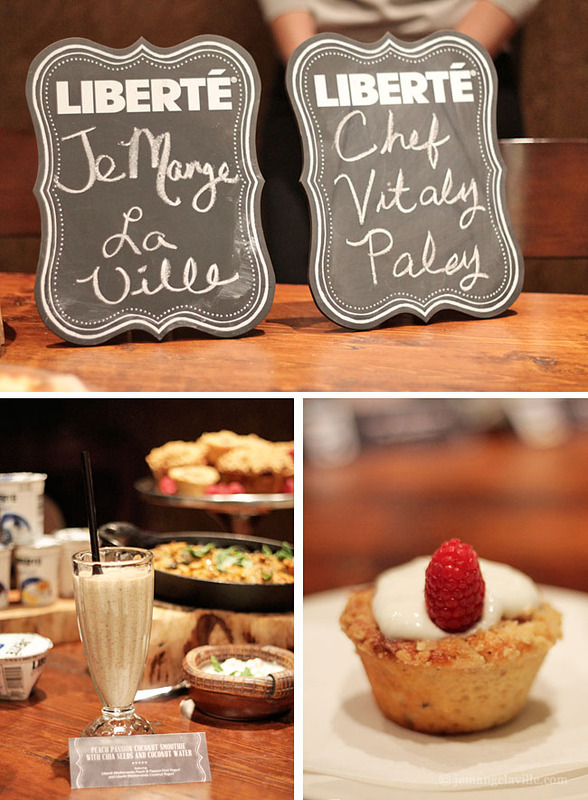 LibertÃ© uses a blend of cultures = to create two smooth, creamy varieties and several delicious flavors. MÃ©diterranÃ©e is LibertÃ©â€™s signature, whole-milk yogurt available in seven delectable flavors. 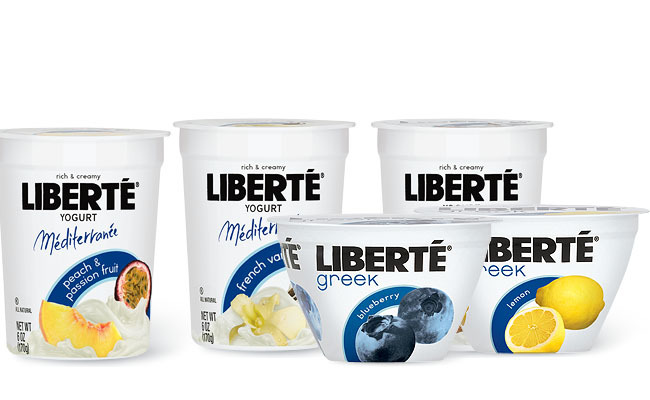 LibertÃ© Greek is a fat-free delight with a clean, fresh-dairy taste and offers six flavors. Once at Imperial, I got ushered into a small room off the kitchen with a group of very nice PR people where we talked yogurt with Chef Paley. 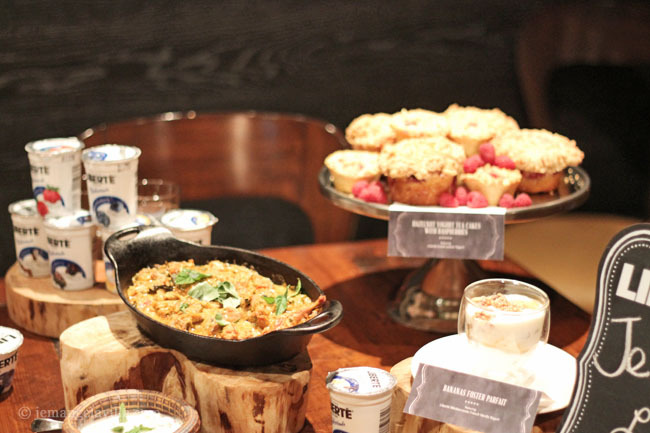 The table was loaded down with all sorts of delectable yogurt treats. 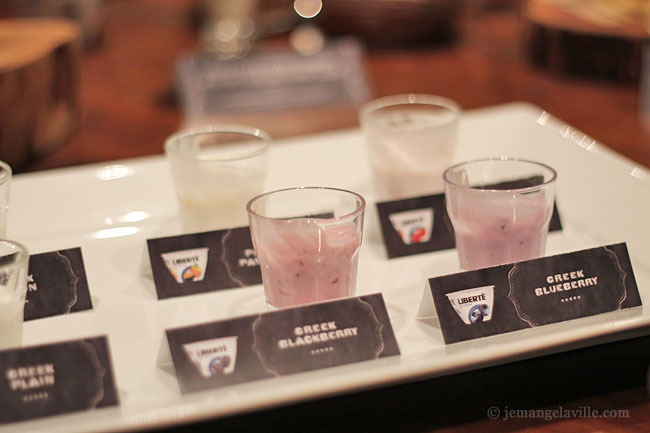 First, I was able to sample all of LibertÃ©’s yogurt varieties (this took awhile as there’s both a thick Greek version and a creamier, “MÃ©diterranÃ©e” style). All were really excellent but I think my favorites were the blueberry (both types), the Greek lemon, and the French Vanilla and Coconut MÃ©diterranÃ©es. In addition to all of this yogurt-tasting, I also sampled two recipes that Chef Paley developed using these yogurts – Bananas Foster Parfait and Hazelnut Yogurt Tea Cake with Raspberries. Both amazing! In fact, I’ve already made the Bananas Foster Parfait at home and have posted the recipe below. After sampling all of this, it was then off to a spot right near the kitchen while Chef Paley cooked up a super fragrant Quail Tikka Masala on the open grill and threw together a delightful Peach Passion Coconut Smoothie with Chia Seeds and Coconut Water. To accompany the Tikka Masala there was Radish and Cucumber Raita. Oh, and there was also wonderfully crispy grilled flat bread…because of course there was. 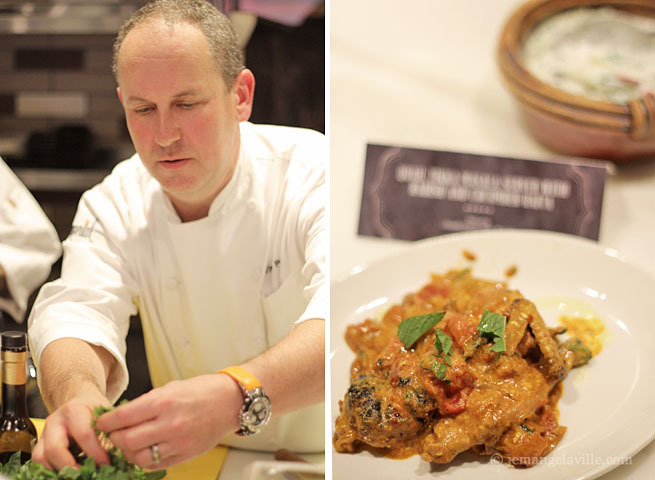 The Quail Tikka Masala was just awesome. Spicy. Creamy. Quail-y. He was joking about putting that on the menu. I actually hope it wasn’t a joke, as it was really, really good and I would totally eat it again. 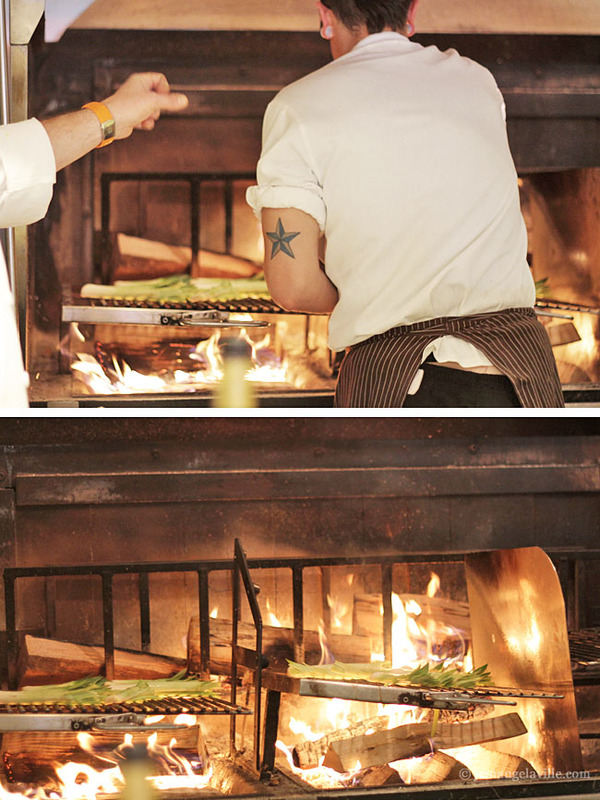 While my tasting was winding down, they were starting to grill some leeks for a dish on the dinner menu. I couldn’t resist taking a couple of photos. 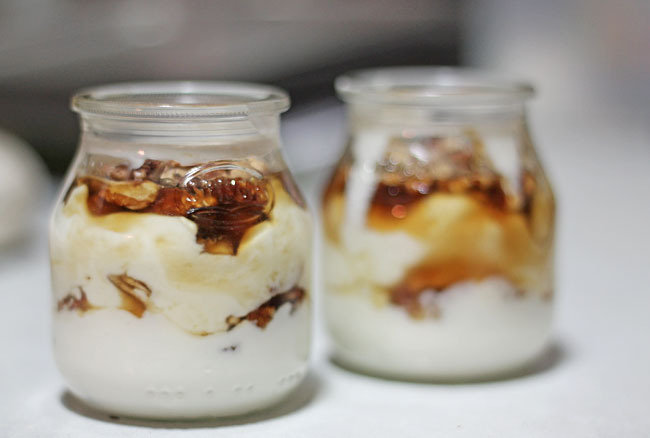 Bananas Foster Parfait: When I made the recipe at home, I opted to halve it and make two small parfaits, mainly because the glasses I wanted to use were small and I only had one container of French vanilla yogurt on hand. I also cut my bananas a bit smaller than listed below, because my glasses were seriously, pretty small. The verdict: just as good at home! A seriously satisfying dessert in like 30 minutes (and it only took that long because I had to let the whiskey/brown sugar/banana deliciousness cool down). 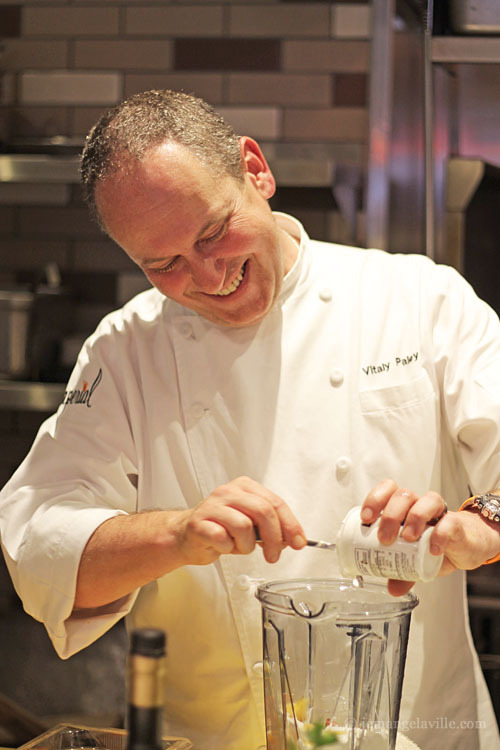 Recipe from LibertÃ© with Chef Vitaly Paley; makes 2 12-oz glasses or 4 6-oz ones. In a sautÃ© pan, combine brown sugar, whiskey, butter and pinch of salt. Over low heat, cook to melt sugar. Continue simmering until thick and syrupy. Peel the bananas and cut each in thirds then each third split lengthwise, for a total of 12 pieces. Add the bananas to the pan and cook until just soft. In a clear glass, spoon half a container of LibertÃ© MÃ©diterranÃ©e yogurt. Top with 3 banana pieces and a sprinkle of nuts. Spoon remaining yogurt over, then 3 more bananas and some of the pan syrup and a last sprinkle of nuts. Repeat with second glass. LibertÃ© Yogurt in Portland: So far I’ve seen it at New Seasons. I was told that it should also be at large stores like Fred Meyer. That is seriously the best yogurt out there. Lucky you!